In a good modern kitchen, few items hold high importance. A good kitchen isn’t just defined by how it looks from the outside, how well it has been furnished, or how amazing its physical appearance is. There are many other factors which in reality define a good kitchen. These include high-quality cookware, baking sets, knife sets, cutlery, and utensils as well as other crockery items. 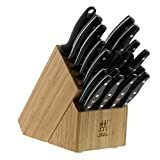 Knife Block sets hold high importance in a kitchen because without a knife no dish can be cooked. Knife block sets are sets of different knives which are used for peeling, slicing, or cutting off food items. However, not every knife set is safe and up to the required quality standards. For this reason, we bring you the review on Top 5 Premium Knife Block Sets in 2018. Read the following review and make your purchase. The Victorinox 11-Piece Knife Set with Block is a great knife block set which is available in several different colors and sizes. 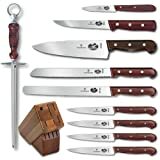 The 11-piece Knife set includes 8-inch chef’s, 8-inch bread, 6-inch boning, 3-1/4-inch paring, 10-inch slicing, and four 5-1/4-inch steak knives, plus 10-inch sharpening steel, and solid oak storage block. The set has been made in Switzerland. The blade is made out of High carbon stainless-steel which provide maximum sharpness and easy cutting or peeling. All the knives are ice-tempered which means they are likely to run for longer. The knives have bolster-less edges which make the use of entire blades and provide an ease of sharpening. It is recommended that you hand wash them rather than using a dishwasher. However, occasional usage of a dishwasher is also fine. The safety handles are there which have been beautifully designed for improved balance and comfort while using the knives. The best thing about this set of knives is the fact that the company has given a lifetime warranty against any manufacturer defects and you can claim anytime. The Calphalon Contemporary Self-sharpening 20-piece Knife Block Set is another premium quality knife block set which includes various different types of knives such as 8-in. Chef’s Knife, 8-in. Bread Knife, 8-in. Slicer, 7-in. Santoku Knife, 6-in. Utility Knife, 6-in. Fork, 5.5-in. Tomato/Bagel Knife, 5-in. Boning Knife, 5-in. Santoku Knife, 4.5-in. Parer, 8 Steak Knives, Kitchen Shears and a richly stained maple wood Knife Block. The best thing about this knife block set is the fact that there are pre-built sharpeners which help in sharpening the knife with every usage. These knives are of ultra-high quality as they have been made out of no-stain German steel. Fully-forged and high-carbon material knives are offered in this set. There are a full-tang design and perfect handles which provide maximum strength and balance to the user. The company offers a full lifetime warranty and there is not a single chance that you don’t like this block set. The J.A. Henckels International Forged Premio 18-Piece Block Set is another great set of knives and has many pieces which include 3 inches paring knife, 5 inches serrated utility knife, 6 inches’ utility knife, 7 inches santoku hollow edge, 8 inches chef’s knife, 9 inches sharpening steel, 8 inches bread knife, 5 inches boning knife, kitchen shears. Also, there are Stamped Steak Knives (8 Pieces). The block is also given with the package. The metallic end cap has the JA Henckels International Logo which proves the authenticity, originality, and genuineness of the items. All the knives have been made out of stainless steel blade which helps in providing precise cutting, peeling and slicing of food items. Ergonomic handles are present which helps in providing a comfortable grip to the user. The handles are also Triple-riveted. These knives are full-tang knives which help in maximizing the life of the knives. Another great set by J.A Henckels is the J.A. Henckels International Forged Premio 19-piece Knife Set. This 19-piece set includes 3″ Paring Knife, 3″ Hollow Edge Paring Knife, 5″ Serrated Utility Knife, 5.5″ Boning Knife, 6″ Utility Knife, 7″ Hollow Edge Santoku Knife, 8″ Bread Knife, 8″ Chef’s Knife, Eight 4.5″ Serrated Steak Knives, 9″ Sharpening Steel, Kitchen Shears, 18-slot Wood Knife Block with Cherry Finish. Even though the set has been made in China, it has a slightly better quality than the regular Chinese products. Lifetime warranty on all the items has been provided by the company. The forged construction and bolster provide a better and improved edge retention and ease of sharpening the knives again. Steak knives are stamped whereas the other knives have a fully forged blade with a full tang. The last position in our list has also been secured by another product by J.A Henckels. The Zwilling J.A. 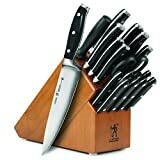 Henckels 30782-000 Twin Signature 19-Piece Knife Block Set is a great knife block set which includes various different knives such as set of eight steak knives (non-serrated), 2.5-Inch peeler, 4-Inch parer, 4.5-Inch utility, 5-Inch serrated utility, 6-Inch utility, 8-Inch chef, 7-Inch Santoku hollow edge, 8-Inch bread knife, kitchen shears, 9-Inch sharpening steel, (8) steak knives. The block is also provided and has been made out of bamboos. These are again very premium quality knives which have been made in Germany and are covered under the lifetime warranty program by J.A. Henckels. These knives are dishwasher safe to a certain extent but it is recommended that you wash them by hand immediately after usage. The difference in this and other sets by J.A Henckels is the fact that this set has ZWILLING Special Formula Steel along with FRIODUR blade which has been ice-hardened to 57 Rockwell Hardness. The above-mentioned reviews are likely to help you in your purchase. If you like our reviews, do leave us a comment below and share this page with others.